Day 29 of port issues: slow-downs, lack in port production, ILWU walk-offs, truck congestion, and all-over harm to business, agriculture and the economy. The long term repercussions of this are yet to be seen. We had NO idea that this was just the beginning of the chaos that would ensue and still continuing through today. Some background: The contract between the ILWU and the PMA has been negotiated since July 1, 2014. The previous contract expired on June 30, 2014 and both parties began the negotiating process for the new contract in May 2014. I probably don’t have to do the math for you, but we are in our 8th month of negotiations. It’s almost humorous. It is in fact beyond reason that two entities cannot come to an agreement in 8 months. It is beyond reason that because of these failing negotiations, that small business, agriculture commodities and West Coast state’s economies are hurting. It is beyond reason that our government is yet to step in and go up the chain of command and demand the President of the United States to order a Federal Mediator. The last we heard from the White House was mid-November when POTUS said he is “confident the two can come to an agreement.” Well Mr. President, it’s been 8 months. At what point do you step in? How long will you allow our PUBLIC PORTS to be inefficient, costly and unreliable? Let’s look at what they may be negotiating. From multiple sources, it seems there are 2 items that are at the table: 1) Benefits. Specifically who pays the “Cadillac Tax.” 2) Automation. 2) Automation. At first glance, more automation equals less jobs. Right? Here’s what I don’t understand. ILWU’s rallying call is “An injury to one is an injury to all.” So, the ILWU wants less technology, less automation. But what if it makes things safer? Would you accept it then? Or would you be so stubborn and immovable that you simply won’t listen to the word. If the long-term effect of no automation is business moving away from your ports that you work at, then you’ll lose your jobs anyway. I’ve read many articles and watched video’s of ILWU’s own spokespeople claim that “the boss’s” only focus is profit. See one here. Here’s a newsflash: business needs to make money in order to continue year after year. It’s called profit – and profit isn’t a bad thing. It keeps YOU getting that paycheck. You should be helping your boss make a profit – not be against the idea. Maybe you noticed the email from above and it’s time-stamp: 7:59am on a Monday morning. Do I think it’s coincidence that this start of a slow-down happened at 7:59am on a Monday morning? About 3 weeks before Black Friday? Almost 2 months before Christmas? Absolutely not. The ILWU is very smart, very powerful, and very strategic. If they were to strike, the President could enact the Taft-Hartley Act. They didn’t. They began a long and calculated work slow-down as a negotiation tactic. And it appears to be working. Eventually they will get their way – and I would prefer it to be tomorrow, not next month. So, you might be one thinking I am pro-PMA and anti-ILWU. I’m not. PMA? You’ve failed too. 1) Given the tremendous economic impact (West Coast ports support more than 9 million U.S. jobs) of our industry across the nation, we will act with an awareness that these talks have ripples beyond the docks. 2) With competition for discretionary cargo growing stronger every year, we will endeavor to enable West Coast ports to operate efficiently and productively. 3) Knowing that a reliable labor force is essential to our ports’ standing, we will seek to deliver dependable labor on behalf of our members. I agree that these are important. I agree that “reliability, efficiency, and productivity will be the keys to success.” And you also say in your report that “…safety efforts led to the lowest level of injuries ever recorded.” Then what’s wrong? Why can’t you make this contract happen? I have to think that there is something inherently wrong here. Labor unions don’t realize that long-term success of the ports means long-term jobs for them. Employers either aren’t listening to the labor unions, or they don’t know how to communicate with them. Until these under-lying issues are rectified, then investment – and looking at the West Coast port’s future as positive – is futile. 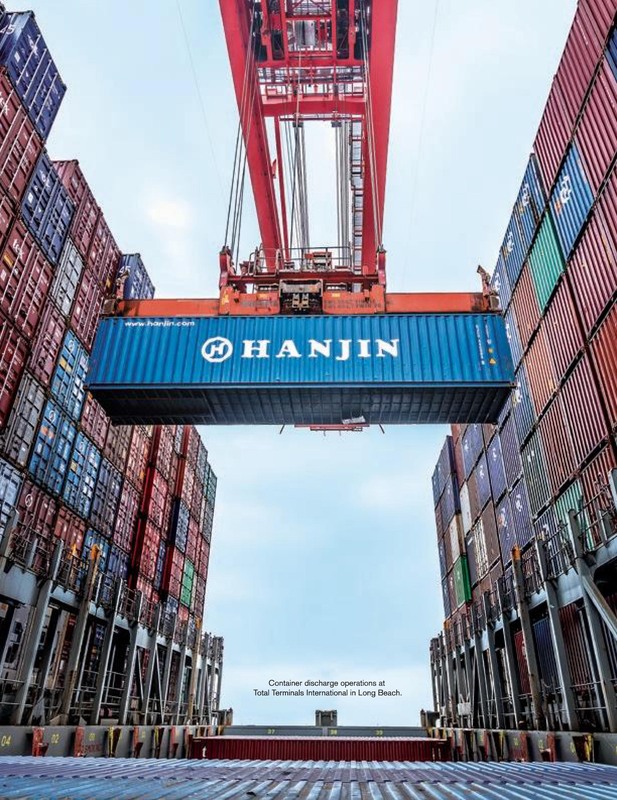 The West Coast ports are the gateway of choice for goods sent to and from Asia. We are the most efficient route. Not considering anything else, the shortest route between Point A and Point B is always a straight line. Now when you bring in other variables, that line (or in our case, shipping route) begins to change. In 2002, there was a 10-day coast-wide port shutdown that sparked concerns. Add to this contentious contract negotiations between the Office Clerical Unit and the Harbor Employers Association in 2012, the ILWU Local 8 and the IBEW skirmish over who plugs in and unplugs reefers a few years back, and other regional grapplings have raised questions to the West Coast’s reliability. Was this enough to move cargo away from the West Coast ports? Yes it has. 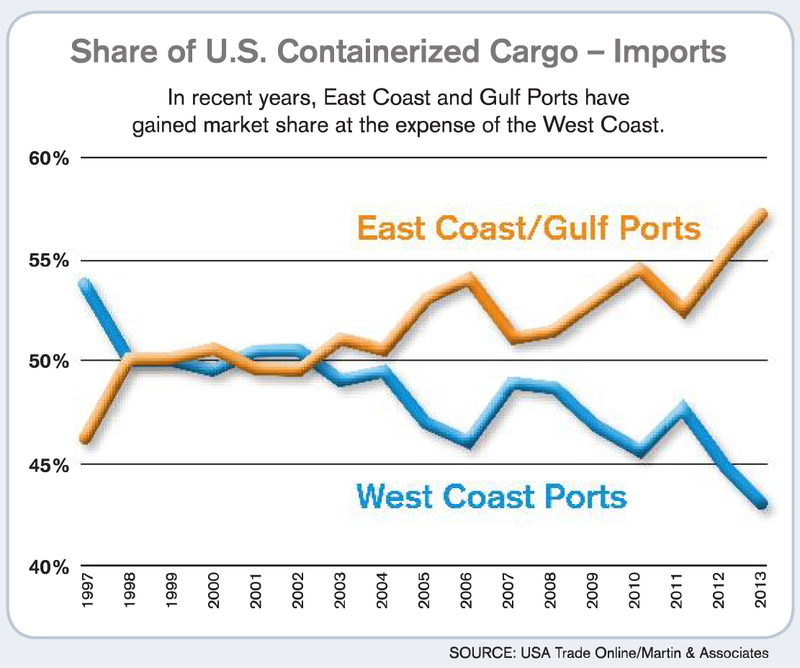 East Coast/Gulf Ports showing a large increase over the past 6 years. Do not invest another dime into technology, into automation, into innovation. Not until you two INCREDIBLY POWERFUL entities can learn to talk to one another. Here’s some advice: PMA, learn to communicate. ILWU, take some business classes. For the sake of us all. ← Why this affects you.